Quite often your opponent will be on all fours in a defensive position. This gives an excellent opportunity for this strangle. Approach your opponent from the side thrusting your left hand under his chin catching his right collar deep on the other side. As you do this swing your right leg over the opponent's body and roll over to his right side clamping his body tight between your two legs. As you start to roll over, thrust your right arm under the opponent's right armpit to catch his left lapel. You should now be as in plate 198. To apply the strangle, pull up sharply with your left hand against the opponent's throat. 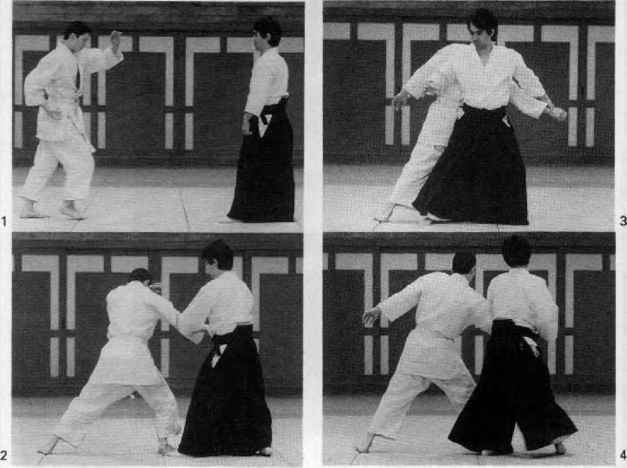 At the same time lock the opponent's body tightly with your legs and pull down with your right hand in the opposite direction to your left hand. Providing you have inserted your left hand deeply in the opponent's collar, the resulting leverage against his throat will cause him to submit. It is essential to get the left hand position as quickly as possible.